It’s hard to be more global than the nights in Shanghai. After experiencing the night life of Berlin, Paris, New York, Barcelona, Dubai, you must plunge into the most wideawake night life on the planet. 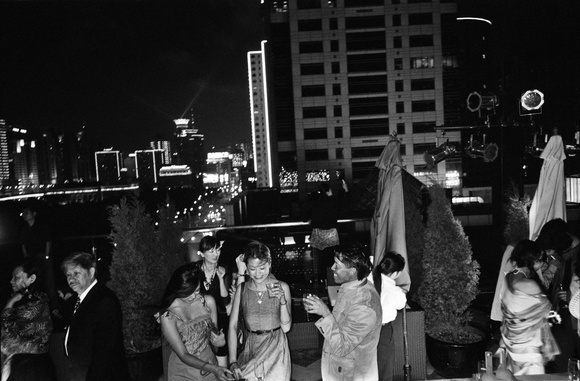 Shanghai nights are just like the country itself – exploding with energy, yet cautious about joining the mêlée. Young Chinese and expats from all over the world mingle together in a deluge of music ‘made in China’ – and elsewhere. Globalization is here, in the Shanghai nighttime. There is no place like Hengshan Lu. Every night of the week, the road gets completely congested around 10pm, when taxi cabs start queuing in front of the numerous clubs, blocking the way for the rest of the traffic. The sounds of loud and repetitive beats can be heard from far away. As you approach the main part of the street, luxury cars appear like the highlight of the latest auto show; Ferrari, Porsche and Maserati are parked directly on the sidewalk, where it is absolutely forbidden to park during the day. The smell of grilled food coming from street vendors fills the sidewalk. The Hengshan road crowd is young in age. Groups of girls, wearing only a few square centimeters of clothing, are passing through the various club doorways. MT, Phoebe, CD3, Westside – different names but same basic concept. Very loud music, hundreds of tables, more or less private, a bar and a small dance floor accommodate a mixed crowd of customers and staff. Most of the customers are playing a variety of alcoholic games involving dice…. About ten years ago, most of the club scene was concentrated in a few streets like Hengshan Road. With the development of Shanghai and the arrival of many foreign investors, the scene has spread all over the city. The small clusters of bars have grown exponentially, slowly adapting to the new and more demanding Shanghai crowd. From just a few music clubs very similar to each other, the city is now offering every kind of venue, from high-end whisky bars to small underground dives, clubs, live houses, and regular corner bars.